I’d been hanging out to read Altaica ever since I saw the cover art (yes, I know, I’m shallow) and once I had my hands on it, I devoured it (in the literary sense). The storyline was engaging, the plot kept rolling along and there was never a moment when I was bored or tempted to put the book down. At the start, I did have a little trouble with the frequent changes in point of view – which sometimes happened three or four times within the same scene – but I quickly became used to the head jumping. My only quibble was, because there were so many characters to keep up with, I didn’t have the chance to connect with any of them. There were a few scenes (the one with the horses and the river springs to mind – you’ll know it when you read it) that weren’t as heart-stopping as they could have been because I hadn’t REALLY connected to the characters and didn’t care enough about their plight. Maybe if one or two of the minor characters hadn’t had their own point of view, I’d have had more time to get to know the others and those moments would have been as gut wrenching as I know they could have been. Will I buy the sequel? YES! 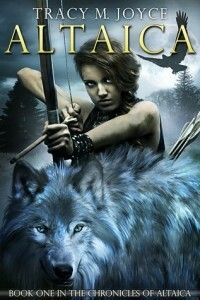 Despite my quibble, I enjoyed Altaica and I’m looking forward to what Ms Joyce springs on us next.